Constantinople and Galata, 15th C Florentine chest. MMA. In the summer of the same year (1423), the αὐθεντόπουλος Demetrios, accompanied by Ilario Doria and his son-in-law, George Izaoul, fled (ἔφυγεν) to Galata with the intention of going over to the Turks; if they did not get to them, to Hungary instead. Matters were in a critical situation because of the war, and the despot Demetrius was forced, at the beginning of the second year of hostilities, to flee (ἀπέδρᾳ) to Galata with Doria, γαμβρός of the Emperor. His father and mother urged him to return, but he was unwilling. His intent was to go to the emperor of the Germans. They unwillingly allowed this and arranged his voyage in company with Matthaios Asan, Doria, and several other archons. I have written on Demetrios before. Nearly everything I wrote was wrong, and this is a reconsideration. In 1423 Demetrios was sixteen and at loose ends. His father had offered him Lemnos the previous year but he refused to go. Then his father had a devastating stroke, which made his brother John sole emperor. His older brothers Theodoros and Andronikos were despots (although Andronikos would give up Thessalonike in September). Constantine had recently come of age and, although we know nothing about him until he became regent for John in November, he was undoubtedly demonstrating a sense of responsibility. Demetrios went across the Golden Horn to Galata. Galata was a self-governing commune under the rule of Genoa, and so going to Galata meant Demetrios had left the Eastern Empire. Other discontent young men went with him -- George Izaoul had been turfed out of Ioannina which replaced him with Carlo Tocco, and Demetrios Kantakuzenos of Trebizond who was in Constantinople because of family problems there. Matthaios Asan went: he remained a close friend for the rest of their lives, later governing Corinth, then arranging a face-saving surrender to Mehmed. Demetrios married Asan's sister. Izaoul's father-in-law, Ilario Doria, is more difficult to explain: he had married Manuel's half-sister, and perhaps he, too, felt he had been passed over once too often. The two different accounts reflect, to a great extent, the prejudices of their writers. Sphrantzes, writing fifty years after the event, showed consistent disapproval of Demetrios whenever he came into the narrative. Syropoulos, writing an account of the Council of Union, was anxious to portray Demetrios in as good a light as possible because he had been a supporter of the anti-unionists during the miseries of Ferrara and Florence. Ganchou (below) adds an important element to the story in printing a letter from Francesco Filelfo to Cardinal Piccolomini. Filelfo not only substantiates the Sphrantzes account, but says that John had sent him to Hungary to tell Emperor Sigismund that Demetrios might be planning to go over to the Turks, and to ask his help in heading it off. But Filelfo also says that there was trouble between the brothers. This is important to remember, even if we don't know what it was. John was nearly double Demetrios' age, and his teenage years had been burdened with training for being emperor. At present he was burdened with a dying father and his differences with his father, and overwhelmed with the threats to the City, the Morea, and Thessaloniki from the Turks. There is no information about Demetrios for 13 years. He took up the rule of Lemnos in 1425 (once he was of age -- he had rejected the position earlier, when he would have had to have a regent), and later married (probably) the sister of Kantakouzenos Stravoummetes, a governor of Lamia. She died. He married Zoe Paraspondylos in the spring of 1436. Then in November 1437 he was required to accompany John to the Council of Union at Ferrara. Syropoulos quotes John as saying, "Everyone knows why he has to come with us." Disloyalty is assumed, but there is no evidence. What we know about Demetrios at the Council depends for the most part on Syropoulos, and recall that Syropoulos appreciates Demetrios' position (although Demetrios had been extremely rude to Syropoulos in Ferrara), while trying to show John at a disadvantage. John was very much at a disadvantage: quite apart from the humiliation of having to attend the council at all, if he had a chance of aid for Constantinople, he was was in severe pain from gout, bedridden much of the time he was there, and surrounded by several hundred orgulous Greeks. Syropoulos shows us John's public humilations of Demetrios, and Demetrios flailing to assert himself. Demetrios was 30 years old by the time of the council, married, a despot. At least twice, Syropoulos tells of John asking Demetrios for his opinion in doctrinal discussions, calling him ἀδελφούτζικε. 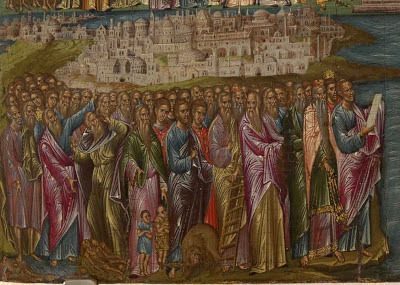 John took Demetrios with him and the patriarch to confer with the pope, then ostentatiously left him to wait in a courtyard for three hours. Demetrios left Ferrara and went to Venice. When the council was forced to move to Florence in early 1439 because of plague, John asked Demetrios to join him. It took the patriarch -- Joseph II -- to persuade him to come, but John waited in Florence for three weeks for Demetrios to arrive. There was another episode of ἀδελφούτζικε. 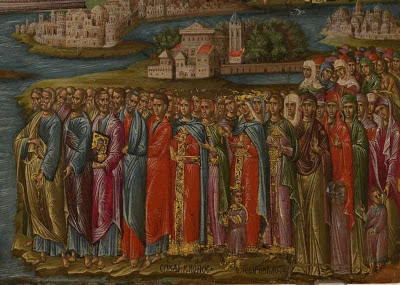 Demetrios asked the patriarch to help him get permission from John to return to Venice. The patriarch did, but then a delegation of cardinals came to see John and he complained about Demetrios. The cardinals asked him to stay until the end. The patriarch -- very ill at this point -- conveyed the information to Demetrios who responded, "I will stay but not because of the cardinals: I stay because of the imperial command. Personally I have no information or experience with matters of dogma. I know nothing about the subject." Then the patriarch died on 10 June. He was buried in the Domenican church of S. Maria Novella where many of the Greek delegation had been staying. Demetrios participated in the funeral service, then four days later left for Venice with Gemistos and Scholarios who could not bear to be present for the signing of the Act of Union. On the way back to Venice, a group of Latins tried to attack an elderly bishop in their group. Demetrios protected him. Syropoulos gives other incidents where Demetrios stood up for anti-unionists. It was with this trip to the West that Demetrios built up his great store of credit with the anti-unionists, and why he had so much support in his later attempts to gain the throne. This is enough for now. Demetrios is regarded as the black sheep of the Palaiologos family. Sphrantzes is taken as the last word. Barker calls him "reckless and selfish," and "worthless": that seems to be the preferred view which disregards his apparently competent rule on Lemnos and at Mistra, his recorded acts of kindness, and his friendship with Gemistos. History prefers the sacrificial lamb to the black sheep. T. Ganchou, "Giourgès Izoul de Ioannina, fils du despote Esau Buondelmonti, ou les tribulations balkaniques d’un prince d’Épire d’possédé," Medioevo Greco 8 (2008) 159-199. If you need a copy of this article, I will be glad to send it. See also, Ganchou, “IlarioDoria, le gambros Génois de Manuel II Palaiologos: beau-frère ougendre?" Revue des Études Byzantines 66 (2008) 71-94. Detail from icon of church of S. Giorgio dei Greci. Georgios Klontzas, 16th C. Complete icon, 47 x 71.5 m.
Museum of the Isituto Ellenico, Venice. The necrology for the Greek community in the parish of S. Antonin lists 1766 names. I worked with the first 500 of them, from 1569 through 1655. One of the things you see is an increase in the annual listings, so that by the end of the 500, it appears that the Greek community of the parish has doubled in size. Events in Cyprus and the current war in Crete would have been major contributions to that growth. One of the things I noticed, in trying to relate names and identify families, is that in the very few instances where the register records the deaths of husband and wife, there is a 17-20 year difference in ages. Of course, this does not allow for second or third marriages, but the register would not have information from which you could identify second marriages. Another gender discrepancy is in the diagnosis of vechiezza (old age) – as the cause of death. Nearly 4 times as many women as men die of old age. Vechiezza appears at age 70 – appropriately. What I find particularly interesting here is that a number of these elderly women are identified as calogerà (nun). Of the 13 nuns in the necrology, 8 are aged 80 and over. Forty-nine women die after the age of 70, while only 32 men do. Three people live to be more than 100: I suspect that means "very very old and no one really knows how old," but someone might have had a record. * 1570, 4 March. Dona Marula, a Greek from Corfu, about 70, sick 10 days with fever, no doctor. * 1579, 2 April. Madona Anna, Greek, aged 80, ill since August from vechiezza; treated by the excellent Mr. Fabritio Rizi. * 1630, 12 October. The widow of Todero Profetti (see below), age 85, from vechiezza after 3 days. There is a large gender discrepancy in deaths at younger ages. In their 20s and 30s, 65 men died compared with 36 women. In their 40s, a few more women than men died, and then in their 70s and 80s, 25 men died compared with 33 women. A great deal could be done with statistics from these 1766 entries by someone who actually knows how to work with statistics. * 1594, 12 July. Matteo, son of Agapito, carpenter, age 16, fell from a balcony in the night. * 1649, 8 May. Gerolemo Karamani from Kefalonia, passenger on the ship Isabetta for Zakynthos. Went on the boat to Malamocco yesterday, found drowned today, about 30. * 1651, 19 September. Sacari da Schiera of Thessalonike, about 32, from a compound fracture, had fever for 6 days. Doctor, the excellent Cortacci; surgeons, Sr.i Orfeo and Zuane Bongioti. The leading diagnoses for the first 500 reported deaths are: fever (110); consumption/etico (37); Catarrh/cataro (31); ponta (22); typhoid/febre maligna (17). I have put below a list of all the diagnoses I found. Here are a few more of the dead. I keep thinking of what Makryannis said: "He was only a Greek: there was no one to ask where he had gone." * 1621, 3 January. Zorzi from Cania, about 40, brought into the church of the Greeks murdered. * 1621, 12 March. Sr. Todaro Profetti, age 75, bed-ridden for several years with gout. * 1630, 29 September. Sr. Calogera, age 25, ill 5 days with malign fever and upset stomach. Doctors were Agapito and Morattini. * 1640, 27 May. Yanni, son of the late Piero from Cyprus, shoemaker, about 34, killed on the bridge of the Madonna on the way to S. Antonin. * 1643, 13 November. Dona Marietta, Greek slave, age 70, sick for a month, died from catarrh. * 1613, 12 May. The magnificent Sr.a Elisabetta Cubli, wife of the magnificent Sr. Lorenzo, age 56, ill for 8 months with a melancholic humor; was seen by the most excellent Galdino and Savoian. *1613, 30 May. Yanni from Nauplion, age 65, went swimming yesterday evening and drowned. Diagnoses in death reports, 1569-1655. Gli atti di morte dei Greci nell'archivio della chiesa di Sant'Antonin di Venezia (1569-1810). 2001. Several years ago, the Istituto Ellenico published a necrology of the Greek community in Venice 1569 through 1810. This consists of the Greek listed in the death register of the parish of S. Antonin, which included the neighborhood of the Greek church, S. Giorgio dei Greci. The Council of Trent, in one of its wiser decisions, had required that each parish church was to keep a record of deaths in the parish, regardless of religion, and so as of 1569 we have names and causes of deaths for Greeks. * 1586, 4 September. Dona Maria Papadia died, age 40, in childbirth. * 1598, 4 July. Piero, son of Mastro Andrea, tailor from Cyprus, 1 year old, from smallpox after 6 days. I worked with the first 500 names in the necrology, from 1569 to 1655. A little more than half of these names were of men. It is difficult to be confident the numbers for gender, but for children under a year, 48 boys are listed in comparison with 17 girls. I estimate at least 30 more girls. Unfortunately, we have no idea whether all the Greeks who died in the parish of S. Antonin were included -- I think not. The register depended on someone's going to the parish clerk and reporting the death. We have no idea how many Greeks lived in that parish or in Venice at any particular date. But the information we do have gives us glimpses into who some of these Greeks were and what kind of lives they had. * 1583, 14 April. Margaritta died, daughter of Sr. Balgian Sosomena, Cypriot, 1 year old, two months after a beating. * 1611, 10 February. Geronimo, son of Nicolò, Cypriot, about 22, took off with a boat, and fell in the water and drowned. Costantin di Medici was the attending doctor. We know nothing about his abilities as a doctor -- his name only appears for deaths, but we learn that his own wife died in childbirth. The doctor Pasqualin Giavanelli lost 2 sons in 6 months, and the doctor Hercole Stavrinos lost two newborn daughters in two years. The necrology shows that 16 newborns died out of the 500, 62 infants in the first year of life out of that 500. For the largest single infant death diagnosis, 28 died from tetanus: that is a common killer in the 3rd-4th-5th worlds today and can come from any injury, but especially from infection of the umbilical cord. The next causes were smallpox and dysentery. A number of children die from vermi, worms -- no adults. Worms most frequently kill because they can cause lethal anemia. Two of the children here died from "suffocation by worms" -- they may have strangled on their vomit, or this may describe the intestinal blockage that worms can cause, or the anemia and the ultimate inability to take in oxygen. Malnutrition in a population makes its presence visible in intestinal disorders among the young, and intestinal disorders generally seem to be blamed on worms. So what is interesting here is that the diagnosis may have more to do with ideas about worms, than with an actual medical reason. What we get in these death reports, particularly with the deaths of the children, is the brutal reminder that they died mostly because of the lack of cleanliness. We have to envision the near-impossibility of being clean in an urban environment before running water -- clean hands (and fingernails), clean cloths, clean water, clean utensils for food. Nearly all the infant deaths relate to something readers here simply take for granted, but something that is not at all simple. * 1595, 5 December. Yanni, son of mastro Zorzi, Greek tailor, age 3, sick from worms and smallpox for 6 days. * 1596, 29 September. Momolo, son of mastro Andrea, Cypriot tailor, infant of 16 months, sick for several months from worms. * 1598, 8 May. Christina, daughter of Sr. Zorzi, Greek tailor, age 4, sick from fever for a year. * 1599, 16 November. Yanni, son of Zorzi, Greek tailor, born in the night. * 1614, 31 August. Veneranda, daughter of Bona of Constantinople, age 3, suffocated by worms yesterday evening at 4 hours of the night (10 p.m.). The channels of the Euripos at Egriboz/Negroponte. Detail from Camoccio etching, ca. 1571. Kiliç Ali Pasa became admiral of the Ottoman fleet shortly after this story took place. His personal story began when young Giovan Dionigi Caleni was taken captive from a coastal town in Italy, Capo Rizzuto at the SW corner of the gulf of Taranto, and enslaved. After some resistance, he converted to Islam, and his natural abilities allowed him to rise rapidly in the Ottoman fleet. He became famous as the pirate Occhiali, alternating periods as a corsair with naval service, and Capo Rissuto now has a memorial to him. . He was the only Ottoman commander to escape from Lepanto, bringing out with him the remnants of the Ottoman fleet. He was a patron of the aged architect Mimar Sinan who built the important Istanbul mosque named for him. Evliya appears to be the only discoverable source for this story. Pierre MacKay is my source and the translator. In the year … in the time of Sultan Khan the second, Kiliç Ali Pasa, the supreme commander on the island of Cyprus, came to the aid of Kara Mustafa Paşa and, with four galleys of his own Uluç Ali Pasa chanced on 10 infidel galleons. He fought a fierce battle with the infidel, lasting all day and all night, until finally, making it appear that he would easily be worsted, “he took flight from the pursuit of infidels,” and with a dash forward at full stroke came into the harbor of Kızıl Hisar. But right behind the place where he intended to drop anchor, up came the wretched infidels in pursuit, so Ali Paşa could not stay there. He went on into the gulf of Negropont and dropped anchor beneath the castle and lay there without fear or apprehension. But the infidel with his ten galleons came into the mouth of the strait and lay at anchor there, saying, “Whenever the Turk leaves, he is mine!" 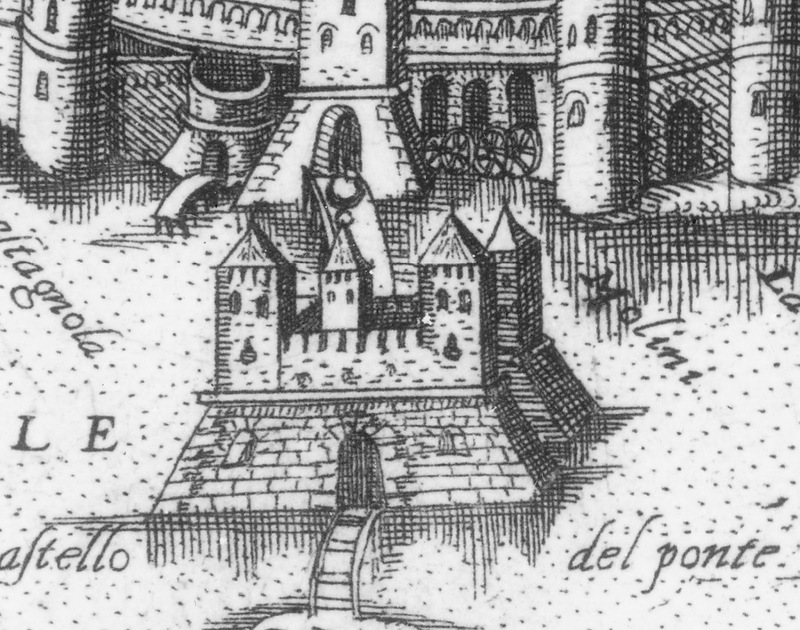 Note "Molini" to the right of the little castle, and the mill wheels behind. 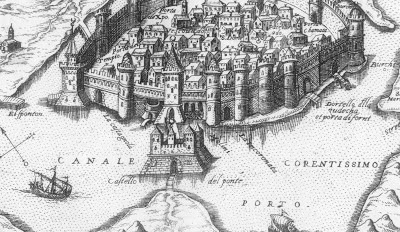 With the genius of an Aristotle, Ali Paşa took the marines and galley slaves out of his four galleys in the middle of one night and, at either side of the water in the channel that flows beside the mills of the castle bridge, the ones we have already mentioned, he massed a group of prisoners at the rock, with the picks of Ferhad in their hands. Then he had them cut away at the rock on either side until the channel was wide enough for a galley to pass through and, in the middle of the night, he took out the awnings from the four galleys they belonged to and set them up on land. Then he went out with the four ships through the afore-mentioned mill channels he had cut, on past the point of Oreos, at the far end of the island, and back down around the point of Kızıl Hisar. In the early morning, the infidels, seeing from their ships that the Turkish awnings still remained in the harbor, were off their guard but, at that very time of morning, while all the infidels lay drunk and besotted in sleep, Ali Paşa, with his four galleys, entered the infidel ships crying, "Allah! Allah!" and rounded up the infidels from both bow and stern. Thus, Ali Paşa herded the infidels up into their own ships at sword’s point, in the twinkling of an eye and, by the will of God, he captured ten enemy ships with four galleys. When he returned victorious and successful to the royal palace, having overturned the idols of the infidels, with their crosses, he was received with a great celebration of cannon and musketry fire by Selim Khan himself. Afterwards he held the fully independent post of Grand Admiral, with three horsetails and, near the Arsenal, he built a luminous mosque out of the great booty he won. Even now, in the place where Ali Paşa cut away the rock, at the channel for the Egriboz mill, if it were desired, one could remove the mill wheels from the channel, and it would be possible for a (/5/) galley to pass through. So much for that. Kiliç Ali Pasa's channel, much widened, is the channel now seen at Halkis. The previous, main channel was closed up over several centuries, and the island castle and city walls destroyed in the late 19th century. Pierre MacKay is currently preparing a study of the history of the dual channels at Negroponte for which previous authors have made assumptions, mis-citations, and unsubstantiated claims. Sixty years ago this day -- 2 June 1953 -- I was in Nigeria, huddled with a group of Baptist missionaries beside around a short wave radio attached to a car battery, straining through the static to hear the occasional word or trumpet from the coronation of Elizabeth II. She had become Queen in Africa, I lived in Africa -- it was too wonderful! In January 1979, I flew from Greece to London to meet E. It was cold, cold to the bone, unbelievably grey after Greece. E kept saying he did not "get" the monarchy, so I took him to see the crown jewels at the Tower. When I had first seen them in 1953, they were in the Round Tower, and I remembered walking around the glittering mound of gold and jewels. In 1979 they were in a different space, set along a table as if for an estate sale, poorly lit, without glitter and glamour, over-determined tawdry gilded ostentation. The exhibition room seemed nearly as grey and chill as outside. We were in line behind a young schoolteacher and her class. The children were conspicuously poor, over-run shabby shoes, darned socks, patched elbows and knees, coats with mis-matched buttons and sleeves too short, but they and their clothes were very scrubbed and clean. They seemed very soft, very blond, like a flock of goslings. They were so very good. They looked dutifully at each item, clearly no more impressed than were we. Then a girl stopped and gasped. The children near her stopped and looked where she was pointing. "Ooh, look!" the gosling breathed. 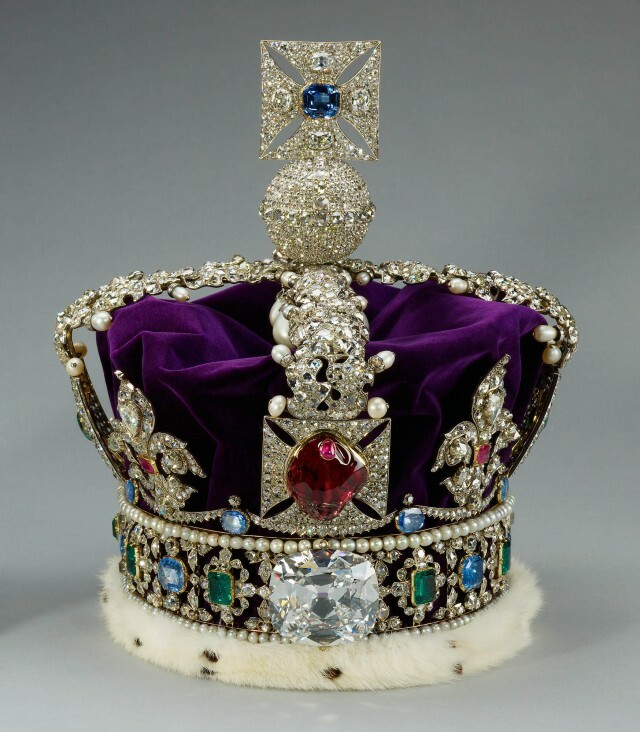 "It's our Lizzie's crown!" The children flocked, a soft shared "Ooh!" floated up, and for a moment the childrens' radiance made the jewels shine.